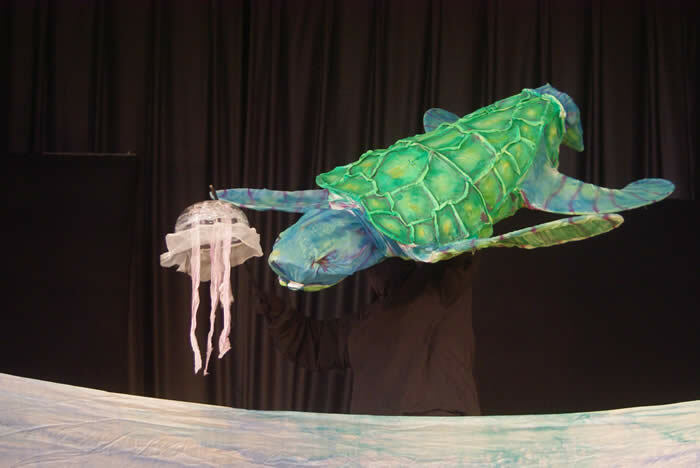 This puppet pantomime with live music tells a meaningful story about a sea turtle that is saved from suffocating on a plastic bag, and how the guy that saves him is transformed. Sherri has just lost her third jump rope to the chewing habits of her dog, Brownie. How is she going to get another one? Her Dad won't give her money to buy one, so she decides to EARN the money. Her job is made more difficult when Brownie gets involved. In addition to learning about money, students will learn about setting limits, saying "no" and what happens when you don't take care of your things. 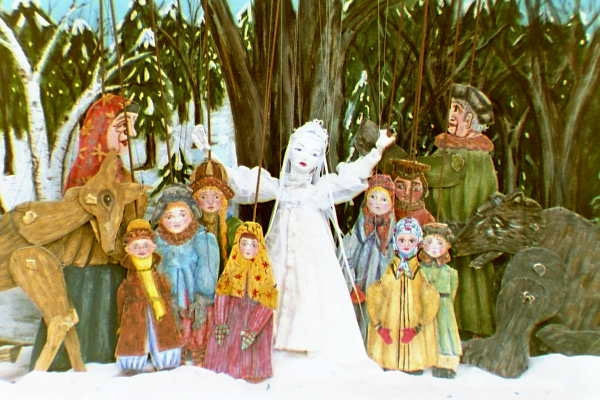 A winter fantasy based on the Russian folktale. Performed with marionettes, live music and an introductory Russian folk dance. The set resembles a Russian lacquer box, the puppets are marionettes performed in Toy Theatre style. Puppets, marionettes, music and audience participation makes this show lively and fun for everyone! A science fiction mystery which celebrates cultural diversity while teaching tolerance, understanding and intergalactic harmony. 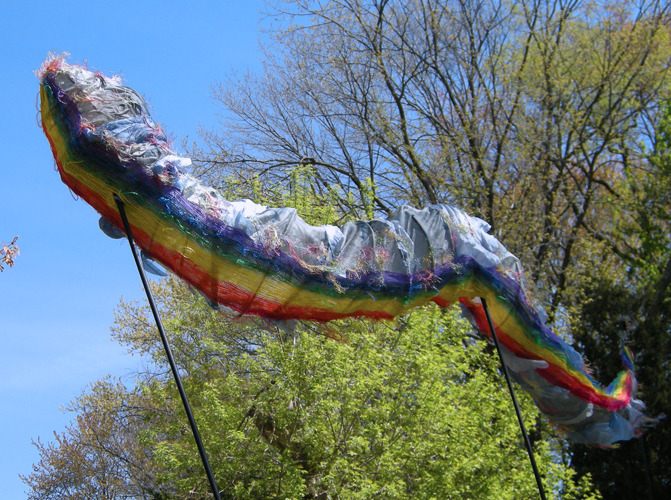 Rod puppets, a marionette, a body puppet and a giant "transformer" puppet are part of the peacemaking magic. "...Not only is the story meaningful and full of metaphors and analogies, but the words themselves titillate the senses...like most impactful works it says more than it says..."
A medieval Christmas farce performed with four puppeteers in full view of the audience. Live music of the period is played on hammer dulcimer. The puppets are table top rod puppets (American Bunraku), sumptuously costumed and deftly manipulated. "It is authentic medieval theater; and certain to provide a new take on the Christmas story." A TV interviewer tries to contact that Most Marvelous Meddler and Gossip of the Grapevine, Mother Nature. A residency developed by Rolande Duprey and Elizabeth Thomas of Upwords Poetry (www.upwordspoetry.com). Puppets can be built and manipulated with the idea that each step along the way can be a prompt to write poetry for the character being created. This workshop was delivered to the Hot Schools Intensive for teachers in 2009. A residency developed by Rolande Duprey and writer Leslie Johnson that incorporates lessons about writing with creating original characters that tell a tale of transformation. This workshop was delivered to the Hot Schools Intensive for teachers in 2010. Another cavalcade of puppets from all over the world! Questions and mysteries surround the origins of puppetry, and students are invited to offer explanations, to manipulate the figures, or to perform a short skit. This demonstration can be adapted for any age group. Shadow figures, rod puppets and other types of puppets can be created. Each workshop is geared specifically to the needs of the group. See list of workshops. Learn basics or develop specific exercises or skills to use in your own work. Puppetry is used in hospitals, as physical therapy, for hard-to-reach children, and for the emotionally disturbed. It is used in Zoos (the San Diego Zoo had a puppet Californian Condor that fed the chicks while the real one was hatching more eggs). Puppetry is a perfect educational tool, helping to foster team work and inter-disciplinary studies. It is a theatre art, and many theatre companies are using puppets in their productions. Do you have a special application which requires a puppet-related question or consultation? Call or E-mail Purple Rock! If we can't answer your question, we will point you toward someone who can.